GreatFlorida Insurance has opened a new office serving Seminole, FL residents and businesses. The GreatFlorida Insurance in Seminole is a full service agency offering a complete line of personal insurance including auto and boat insurance, homeowners insurance as well as commercial policies. Committed to providing the best for their customers, they work with reputable companies across the United States such as Progressive, Travelers and Safeco as well as many others. Many other GreatFlorida franchise owners cite “freedom” as their primary reason for moving over to GreatFlorida. “As a captive agent since 1998, I had only one choice in the insurance market,” says Ana Arguello, owner of GreatFlorida Insurance in Westchester, a beautiful suburb of Miami. The new GreatFlorida Insurance in Seminole office is located at 8979 Park Boulevard. The Everett Financial Group, LLC, GreatFlorida Insurance can be reached at 727-437-7200 or on the web at https://seminole.greatflorida.com. GreatFlorida is the most successful independent insurance franchise in Florida and was recently ranked Top 10 by Insurance Journal for earning over $42 million in property and casualty revenue in 2013. GreatFlorida Insurance can provide independent franchise owners higher commissions and more flexibility than a captive agent who is restricted to representing one insurance provider and fulfilling their company’s quotas. At GreatFlorida franchise owners have the liberty to provide a variety of options that will best suit the needs of their individual clients. For more information about GreatFlorida Insurance, please call (888-478-7801) or visit their website at https://www.greatflorida.com. GreatFlorida Insurance has been providing insurance to Floridians for over 20 years. They are a network of independent franchised insurance agents located throughout Florida, with over 110 offices. Dedicated to helping people make informed decisions about their insurance, they provide professional service and affordable insurance. 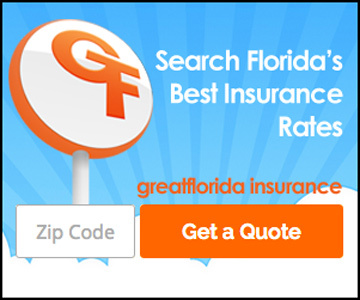 GreatFlorida Insurance delivers customers rate quotes from top insurance providers for health, auto, homeowners, boat, motorcycle, business, renters and umbrella insurance. Call or visit their website today for a quote.